Factor 001 – What You Get When Formula 1 Engineers Design A Bike Without Restrictions | OhGizmo! It has to be frustrating being an engineer who designs Formula 1 racing components given all the restrictions and limitations imposed by the ‘sport’s’ governing body. So it’s not surprising that they occasionally have the desire to throw off the shackles of their F1 overlords and design something that’s all about performance, and not about conforming to regulations. 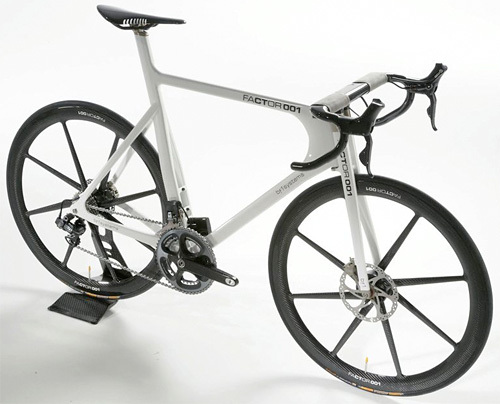 And in this case it’s the Factor 001 road bike designed by BERU f1systems, which is quite possibly the most technologically advanced bicycle ever created. Here’s just a few snippets about what’s gone into the making of the bike, and why you might want one. Factor 001 has a lightweight and highly rigid carbon fibre monocoque structure. Its unique twin-vein architecture can be adjusted to within a millimetre to suit the rider’s measurements and typical riding position. In keeping with the frame’s robust design, the bike’s eight-spoke carbon composite wheels are capable of reliably negotiating tough road conditions. The bike also features the world class Shimano Di2 electronic gear shift, and customers can opt for carbon ceramic disc brakes. Packed with BERU f1systems’ patented technology, the bike’s frame contains highly sophisticated load sensors, wiring, batteries, control cables and lines for its hydraulic braking system, all of which are fully integrated into the composite during construction to give unparalleled efficiency with a clean, uncluttered appearance. Physical structure aside, the multi-channel electronics package available with the bike has unique ergonometric data collection, logging and analysis capabilities. It can simultaneously correlate biometric data from the ride, physical force data from the bike and environmental data to offer a level of analysis previously only available under laboratory conditions. Riders can record everything from skin temperature and respiration rate to atmospheric pressure and humidity and individual leg power output. The individual channels of data can be displayed on the LCD touch screen, all of which are logged and can be downloaded for post-ride analysis. The rider can configure each screen to display his/her preferred parameters, and the system allows the rider to easily switch between screens whilst riding. But what’s an impressive technological masterpiece without pedals? I'd like a demonstration. It does look sleek. I just think the price is a bit out of my budget. Namarrgon: every serious bike is sold in this way, yep without pedals. Think about it: perhaps the rider using his/her own spd or look pedal.